Patty Doyle holds the secret to eternal life, but it may only bring her an early death. Patty is working on a journal of a 14th Century alchemist. But after mentioning it in her blog she gets to the office to find everyone brutally murdered. Now she's on the run pursued by a killer who wants the secret of eternal life it contains. 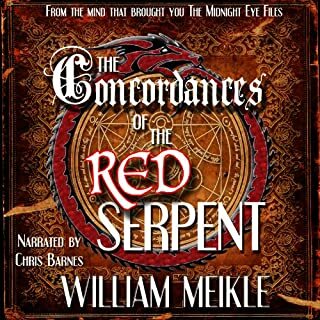 Being the first time reading William Meikle’s work, I wasn’t sure what to expect, but The Concordances wasn’t it at all. It was so much more! The depth of character development and winding twists of the story were highly engaging. Even though it had a slow start, once the story opened up, it was terribly hard to put down. If you like an intelligent read that will keep you on your toes, you’ll adore this book! TEN DAYS, TWELVE COMPETITORS, TWO MILLION POUNDS CASH. What at first appears to be a wonderful opportunity for Damien Banks turns out to be the worst nightmare he can imagine. 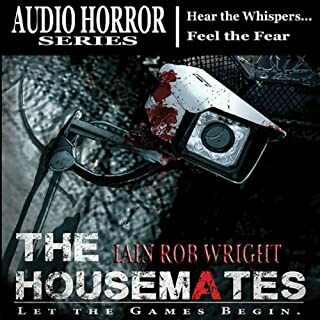 Trapped inside a house with eleven strangers, and a booming voice known only as 'The Landlord' controlling his every move, Damien will be forced to compete not only for the money, but for his life. This was my first taste of Iain Rob Wright’s writing and it did not disappoint. With an overall feeling of extreme creepiness, Iain sets the tone for one of the most sadistic games I have ever read. A gory, masterful tale of revenge and the ugliness of human nature. With twists and turns, Housemates keep me on the edge of my seat and my heart pounding. Different from anything I have read, I would definitely recommend this to any horror lover out there. Iain’s dark sense of humor and ability to instill complete terror paired with the talented voice artistry of Chris Barnes is perfection. Chris has this uncanny ability to breathe life into the books he narrates and this was no exception. With narrating something so horrific, he easily conveyed the absolute terror and pain the characters must have been feeling as they fought each other to the death. His range of expressive voices and his interpretation of the characters made it impossible to put the book down. Hands down, he is one of my top three favorite voice artists. I can’t stress enough how talented this narrator truly is. Can’t wait for the next one, Chris Barnes! A short, urban fantasy tale set in Edinburgh, Scotland. An introduction to the Edinburgh Elementals series. Michael has just moved to Edinburgh, Scotland, to make a fresh start with his three children. While they're out exploring the city, he's relaxing with a glass of wine. That is until a knock on the front door leads to a bizarre revelation from a strange, red-haired woman, and an encounter in the attic with some unexpected guests. The Trouble with Pixies is a very fun and fast read! A delightful UF short with a huge dose of magic and lore. In this introductory tale we met Michael, a single dad who just moved to Edinburgh for a new start and a house full of life. But when a stranger with mismatched eyes shows up at his door, he doesn’t realize he is getting more than he bargains for with his new home…. 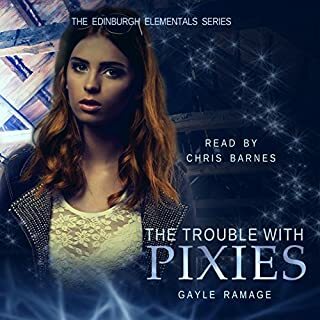 It is no secret that Chris Barnes is one of my favorite narrators and while I am used to his readings having a more darker atmosphere, this lighter read meshed well with his lovely Scottish brogue. Easily bringing the characters to life, it was easy to picture being in Michael’s shoes in this fun short! If you are looking for a quick and engaging read, you need to check out this series! Well done, Gayle and Chris. Can’t wait for more. When John Simpson hears of a bizarre animal attack in his old home town of High Moor, it stirs memories of a long forgotten horror. John knows the truth. A werewolf stalks the town once more, and on the night of the next full moon, the killing will begin again. He should know. He survived a werewolf attack in 1986, during the worst year of his life. It’s 1986 and the town is gripped in terror after the mutilated corpse of a young boy is found in the woods. Creepy and heart-pounding! Adore this narrator! Where do I begin? This is my first time reading Graeme Reynolds and I wasn’t disappointed. He has nailed the whole horror gory, fast paced thriller and nailed it well. American hunter, Carl Schneider has been hunting these creatures for more than half his life. When the call came from the UK that there had been a boy killed, tore to ribbons, he knew what had done it. And he knew how to stop. With the help of Sergeant Steven Wilkinson, they try and hunt the creature down. And as the bodies pile up, it is clear that whatever is in the woods in High Moor isn’t your average dog. It’s something preternatural and its bloodlust can’t be slaked. The plot was a mix of terror and raw emotions of adolescence and it flowed seamlessly between scene to scene as the horror played out. It’s brilliantly written with an ending that will shock you and have you wanting more. So much more. Chris Barnes brings the story to life in an amazing ways. While his natural Scottish accent is one of my personal favorites, he’s a master at all dialects. But the difference with Chris and other male narrators that I have come across is the change in voices. You can clearly tell who is talking just by listening the change in pitch. The professionalism of the actual recording is beyond impressive, from the actual crackling of a CB radio to the muffled sound of a radio program in the background, it totally makes the narration into a full on performance. 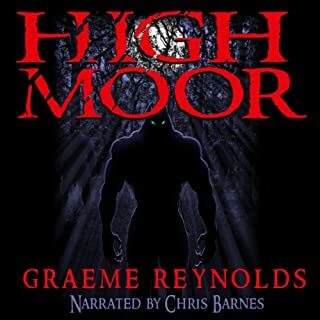 It is very easy to get lost into such a reading and in my humble opinion, Chris Barnes is a voice artist to look out for. Here’s hoping that he will read book two of this incredible series. Fantastic reader, fantastic writer. I loved it.